Mark your calendars and save the date for the fabulous Visual Art Community Art Making fundraiser: Tile-A-Mile. 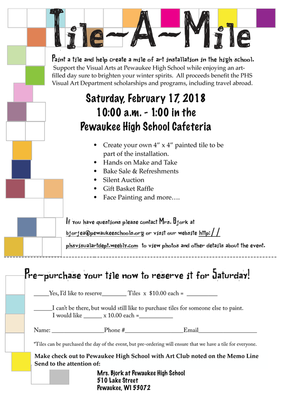 The event will be Saturday, February 17, 2018 from 10:00 - 1:00 with a variety of artmaking activities, bake sale, raffle, silent auction and much more. It will also feature the opportunity to create a tile for $10.00 per tile. Tiles are baked and then framed and displayed throughout the schools with the hopes of some day having a "Mile of Art". All proceeds benefit the PHS Visual Art programs and scholarships. 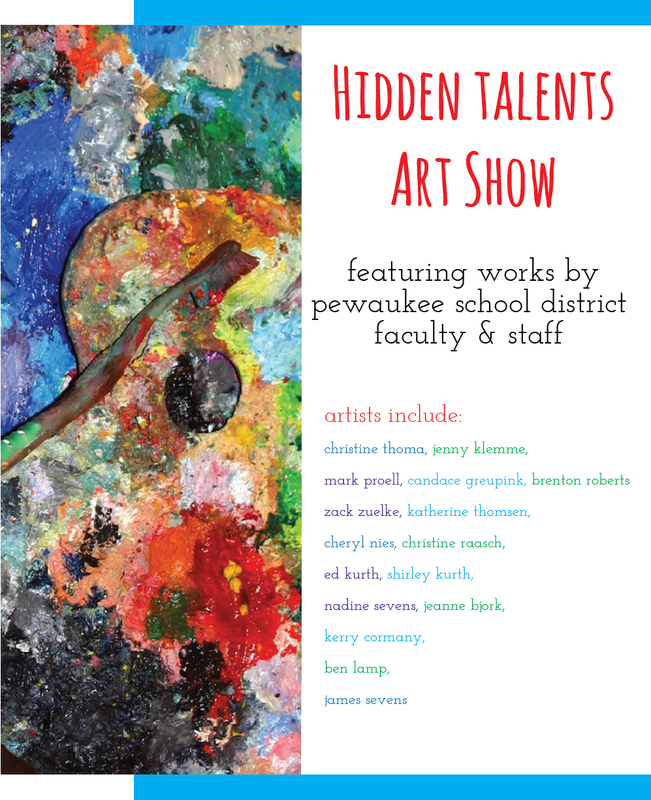 The Hidden Talents art exhibit was created to highlight the talents of the Faculty and Staff of the Pewaukee School District. It features art and craft work by many of the creative employees of the school district. 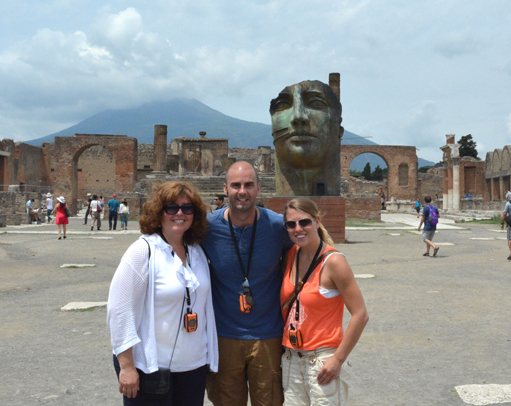 The K12 Art Teachers developed the idea of the exhibit as a way to fill a gap in the exhibit calendar at the beginning of the school year and as a way to celebrate the arts. 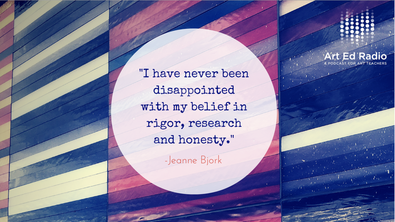 Everyone is creative, not just art teachers! 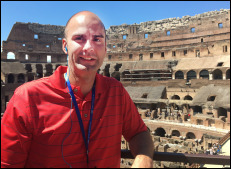 Mr. Lamp teaches Introduction to Art, Sculpture 1 & 2, Art History, AP Art History, Introduction to Digital Media in room 115. Students in Mrs. Bjork's AP Studio Art class continued their classroom understanding and development of college and careers related to art with a Guest Speaker and Field trip. Cari Dulan is an admissions counselor from the Milwaukee Institute of Art and Design and spoke to students about how to build a college level portfolio, scholarships, and career possibilities for those who choose an art school path. This classroom visit was followed the next class by a tour of MIAD in the Third Ward. This field trip day also featured visits to Gallery 2o7 and Oil Paint Gallery. Students met with artists Jeanne Olivieri and Hal Koenig to learn more about running a gallery and how to be a professional fine artist. Students also had a chance to see and visit several PHS alumni who are students at MIAD. Students also sketched and photographed the architecture and other sites in Milwaukee's Historic Third Ward. Mr. Lamp's AP Art History and Art History classes along with Mrs. Bjork's AP Studio Art class visited Chicago on Friday, November 10. The classes experienced a 4.5 hour bus ride with a lake effect snow shower slowing Chicago traffic to a snarled pace. Once the class arrived in Chicago it was none stop art for the remainder of the day. Students saw many masterpieces at the Chicago Art Institute including "American Gothic" by Grant Wood, "The Thinker" by Auguste Rodin. A bustling walk up the Miracle Mile through Millennium Park and then onto the Museum of Contemporary to view more current works by many artists including Jeff Koons, Andy Warhol, Doris Salcedo and David Salle. Students enjoyed dinner at the Water Tower shops and then a much quicker bus ride back to Pewaukee. The experience was fantastic and art-filled. 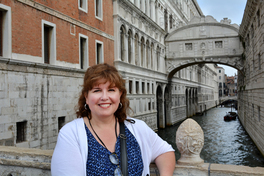 Mrs. Bjork is presenting two sessions at the state art education conference on October 27-28th. Both of the presentations highlight Digital Photography techniques she teaches students in the Digital Photography 1 and 2 classes at PHS. Mrs. Bjork is also a practicing artist herself and employs many of these techniques in her own work. The presentations will feature hands on examples of PHS student art and Mrs. Bjork's own art. 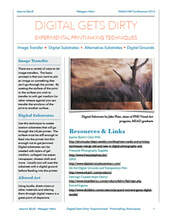 Digital Gets Dirty-Alternative Printmaking Techniques discusses the many alternative ways to create a photographic print including transfers to wood, glass metal and even tortillas! 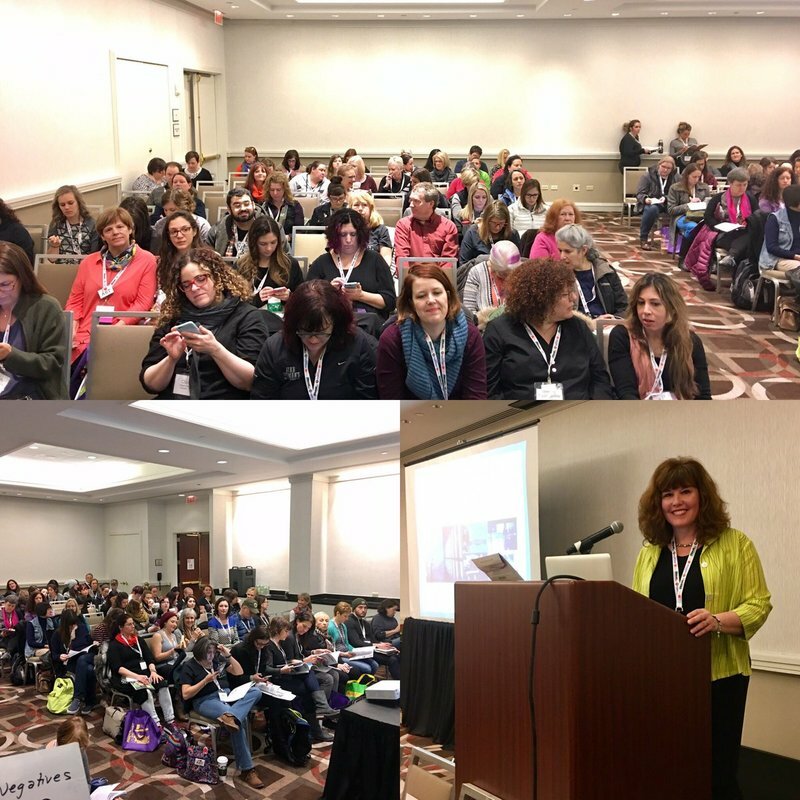 This session was also presented at the National Art Education Association's spring National conference in Chicago, IL in March 2016 and at WAEA State Conference in 2014. 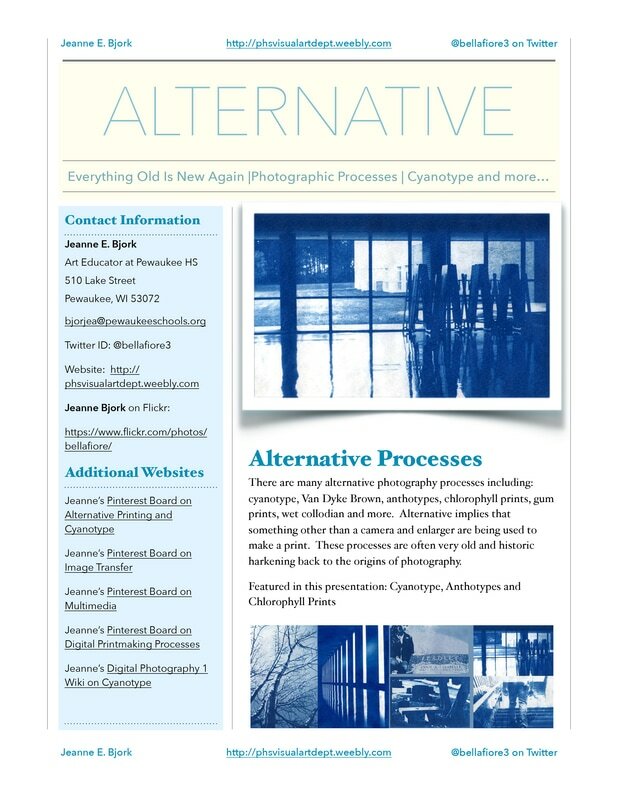 The presentation is titled: Digital Gets Dirty-Experimental Printmaking Processes with Digital Photography. 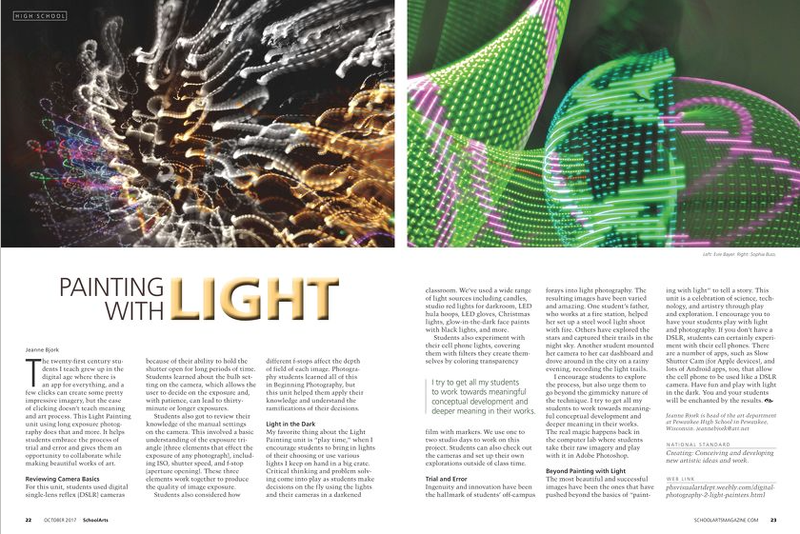 An article about the topic was also written by Ms. Bjork and featured in the May/June issue of Davis Publications School Arts Magazine in 2016. 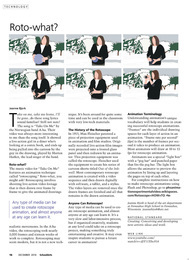 To download a handout from the presentation click here. The second presentation Making Magic-Light Painting Photography explores slow shutter photographic techniques that allow students to create unusual works of art that glow and illuminate the page. 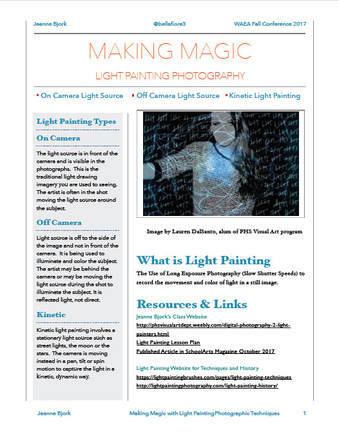 An article about this topic was written by Ms. Bjork and featured in the October issue of Davis Publications School Arts Magazine in 2017 To download a copy of the handout from this presentation click here.